Verona is one of Italy's most popular travel cities. 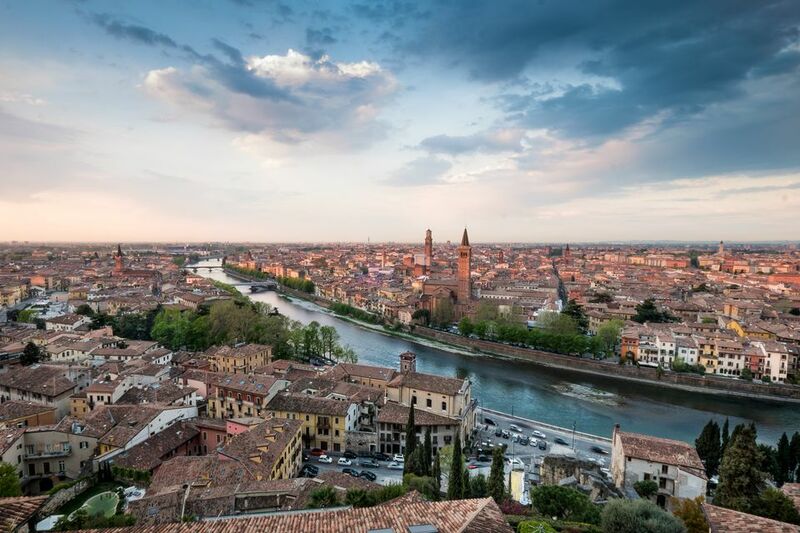 Located between Milan and Venice, Verona is known as the city of Romeo and Juliet and for its Roman Arena but there are many attractions to see. You'll find some of them on this Verona map. If you'd like a guided tour you can book Verona, City of Romance through Select Italy. The attractions are listed in the order recommended for visiting them, but you could also go in reverse starting in Piazza Bra. Piazza delle Erbe is a good place to start a visit to Verona. Originally the Roman Forum, the rectangular piazza is in the heart of the historic center and is surrounded by beautiful medieval buildings and towers. In the middle is a 14th-century fountain with a Roman statue. Although once filled with market stalls, today the stalls mostly sell souvenirs. Several cafes where you can have a coffee in the morning or a glass of wine to end the day are along one side of the piazza. From Piazza delle Erbe walk through Arco della Costa, an arch with a whale rib hanging from it, into Piazza dei Signori, a small square surrounded by monumental buildings. In the center is a statue of Dante and perched atop buildings around the square are more famous signori. This square was once the seat of the city's public institutions and you'll see the Palazzo del Capitanio with its tower, the 15th-century Loggia del Consiglio that was the town hall, and the 14th century Palazzo della Prefettura, formerly the Palazzo del Governo that was a residence of the Scaligeri family. Lamberti Tower, Torre dei Lamberti, is a good place to get an overview of Verona. Climb the stairs to the top (or pay an extra euro to take the elevator most of the way) and you'll have fantastic views of the city and beyond. The medieval bell tower was started in the 12th century and was raised a few times after that until it reached its final height of 84 meters. It's just off Piazza delle Erbe (you can see it towering above the square), near the Palazzo della Ragione. Verona's most popular site is the balcony said to be Juliet's in Romeo and Juliet. The house said to be Juliet's house is in a courtyard off Via Capello. You can see the balcony and the bronze statue of Juliet for free (you can also rub Juliet's breast for good luck). The 13th-century house is a good example of Gothic architecture and inside is a museum with period furniture. You can also see the house attributed to Romeo's family on Via Arche Scaligere and try traditional food of Verona, including horse or donkey meat, at ​Osteria al Duca. The 1st-century Roman theater and archaeological museum are reached by crossing the river on the picturesque stone bridge, ​Ponte Pietra. The theater is built into a hill overlooking the river and outdoor summer performances are held there. Above the theater, the Archeological Museum is housed in the former Convent of Saint Jerome where brothers dedicated their lives to producing medicine and caring for the ill. Inside are Roman mosaics, Etruscan and Roman bronzes, Roman sculptures, and Roman inscriptions. The Romanesque Cathedral or Duomo of Verona is a complex of buildings that includes a 12th-century Baptistery, the Canons Cloister, and Saint Elena Church and remains of a 4th -century paleo-Christian basilica. The octagonal Romanesque baptismal font, decorated with carved Biblical scenes, was carved out of a single block of marble and the Baptistery has frescoes from the 13th to 15th centuries. The cathedral's frescoes are from the 15th to 18th centuries and the exterior is decorated with 12th-century reliefs. Its 16th-century bell tower can be seen from afar. Castelvecchio is a 14th-century medieval complex built as a residence and fortress. There are several towers and keeps and a brick bridge crossing the river. A section of Verona's 14th-century walls was incorporated into the complex. The former parade ground is now a nice courtyard in front of the museum that takes you through 16 rooms of the former palace filled with sacred art, paintings, Renaissance bronzes, archeological finds, coins, and weapons and armor. You'll also get to walk on part of the wall. Verona's Roman Arena is the third largest Roman Arena in Italy (after the Roman Colosseum and the arena in Capua). Built in the 1st century, the arena holds up to 25,000 spectators. Since 1913 it has been the venue for a prestigious opera festival and a top setting for other theatrical performances. In the afternoon, the sun will be shining on the stage so it's a good time to take a look inside the theater. Although part of the seating is in bright orange and red chairs, it's easy to imagine the original look of the amphitheater. Piazza Bra, once a suburban field or braida, is a huge piazza inside the main gate entering Verona. You'll see the Roman Arena on one side of the piazza and near it the neoclassical Palazzo Municipale. Part of the piazza is a garden with a central fountain. On the opposite side from the arena are elegant porticoed buildings with cafes and restaurants along a broad walkway. You can have a glass of wine or coffee in one of the cafes and spend some time people-watching. If you plan to enter several of these attractions, buying a Verona Card may save you time and money.